When designing for the web, @font-face is the most-used technique for replacing boring standard fonts for stylish typographical styles. 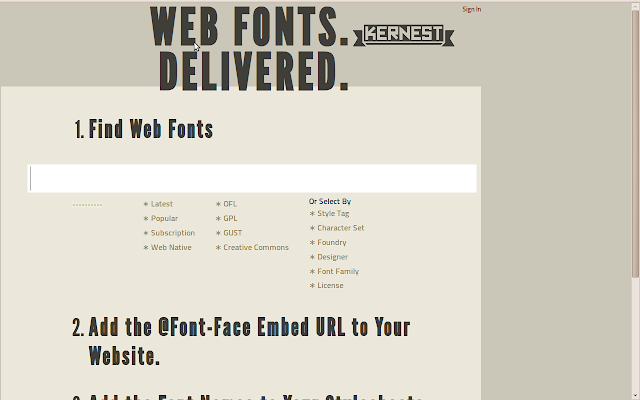 Cross-domain issues are not an issue when using Kernest, though you will need to sign up for a free account and add the URLs for the sites on which you'd like to use your fonts so they're properly referenced. You don't need to download or host any scripts on your own hosting account. 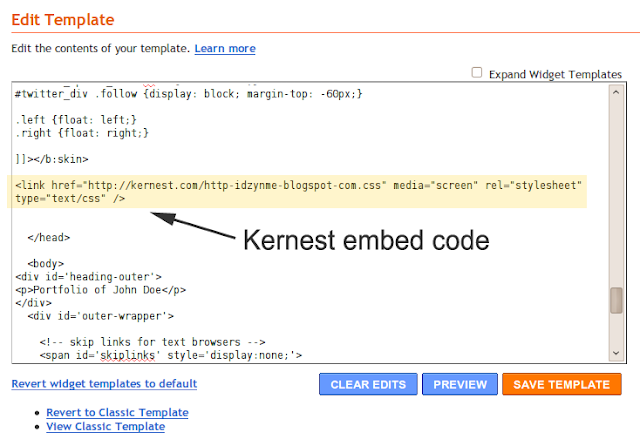 Simply add the embed URL generated for your site in your Blogger template code and tweak the CSS for the textual areas of your design where you'd like your non-standard fonts to appear. Kernest offers a huge variety of free fonts under various licenses including Creative Commons and GPL. Premium fonts are also available on a subscription basis. 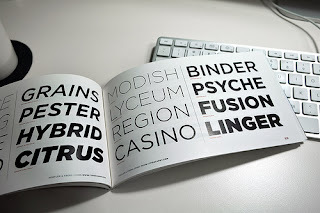 Browse by font style (ie: Serif, Geometric Sans, Oblique); by designer, font foundry or usage permissions. Chunk5 by The League of Movable Type (one of my personal favorites). MgOpen Modata Bold by Magenta Ltd. In order to use Kernest to embed fonts in your Blogger based sites, you'll need to create an account and sign in. 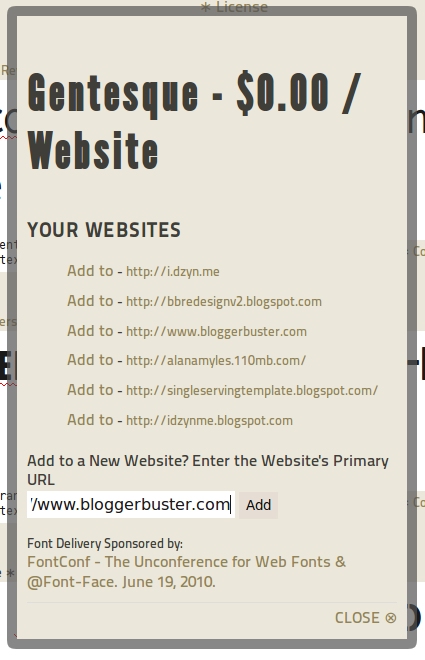 You can add a new site in which to embed fonts by pasting the URL of your blog in the space provided. 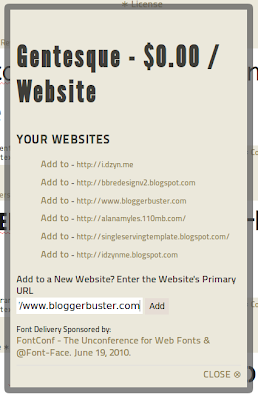 After you've added a site, it will appear in the "Your websites" list whenever you are signed in. Once you've added and selected your site, you'll be presented with the font embed code which you'll need to copy to your clipboard. At this point, it's a good idea to save your template. With the embed code in place, we can replace particular text areas of our Blogger design with the font(s) we have chosen from Kernest. The CSS tags you need to use for your preferred font can be found on the project page for each of your sites. You can access the project page while logged in to Kernest by visiting the "Your Websites" link at the top of every page. Once you've added the relevant CSS tags to the <b:skin> section of your template, preview your design in your browser to see the font changes in action then be sure to save your template. Do you use Kernest for your Blogger template designs? If you're already using non-standard fonts with Kernest, please let us know of your experiences using this free service and showcase your sites for others to see this technique in action. Or if you successfully use an alternative technique, I'd love to hear about it so please feel free to leave your comments below.